Fleet managers in the Seattle area will have an opportunity to learn about biodiesel and other alternative fuels at a workshop Jan. 20. 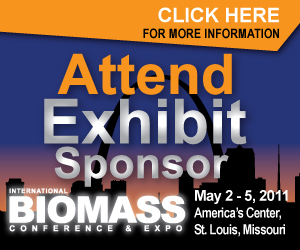 The free event is hosted by the Alternative Fuels Trade Alliance. The competitive singing phenomenon, American Idol, is back for an 11th season and the show will commence with a nationwide bus tour fueled by biodiesel. The 16-city national tour will start in San Diego and end in Boston during the month-long tour. California-based Springboard Biodiesel LLC recently announced that more than 50 U.S. universities and school systems now own and operate its BioPro biodiesel processing equipment, with Arkansas State University being the latest. Port of Stockton officials in California have reviewed the environmental impacts of a proposed expansion to Community Fuels’ existing 10 MMgy plant in Stockton and, according to CEO Lisa Mortenson, the results were positive. A Florida-based biodiesel technology developer formed in 2006 has released a new product that can lower methanol requirements by up to 5 percent. Florida Biodiesel Inc. has been developing the Cyclonic Mixer over the past year. Global Clean Energy Holdings Inc. is leading efforts to develop a new nonprofit research organization focused on developing high-yielding commercial varieties of jatropha. The Advancing Colorado’s Renewable Energy program awarded 15 grants totaling more than $600,000 in an effort to spur additional instate renewable energy development. 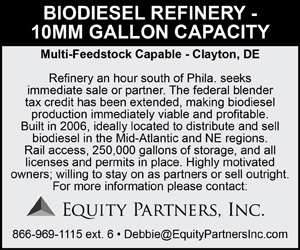 Some of the money is going to biodiesel projects. On Jan. 12 the U.S. EPA announced a plan to defer greenhouse gas (GHG) permitting requirements for carbon dioxide (CO2) emissions that result from biomass-fired and biogenic sources for three years.